It was announced this week that every Pennsylvania school district that applied for one has been awarded a $25,000 grant to enhance its safety and security. School districts in the 86th Legislative District that will receive the funding include Greenwood, Newport, Shippensburg Area, Susquenita and West Perry. The new $60 million grant program, which I supported, was created as part of a comprehensive school safety bill that was signed into law in June and included in the current state budget. 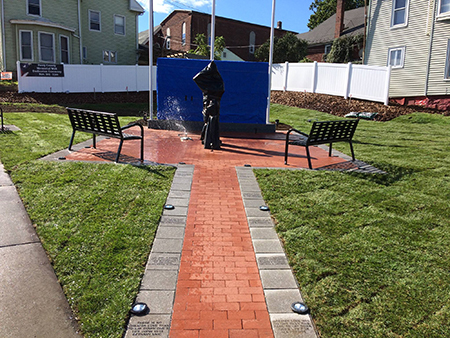 The Perry County Memorial Wall in Marysville will be dedicated Saturday at 1 p.m., following the Veterans Parade. Located along Route 15, across from Blue Mountain Outfitters, the memorial lists the names of all the Perry County soldiers who have been killed in action since World War I. The public is invited to attend. The governor’s decision to veto important cost-saving and education measures last week has left lawmakers scratching their heads. The bills would have dramatically reduced the state’s debt (House Bill 83), required the Department of Human Services to institute work requirements for Medical Assistance recipients (House Bill 2138), and expanded career and technical education (CTE) opportunities for students across Pennsylvania (House Bill 2157). Specifically, both House Bill 83 and House Bill 2157 passed with overwhelming bipartisan majorities in both the House and Senate. House Bill 83 could have reduced outstanding general obligation debt by $1 billion over 20 years, and House Bill 2157 would have made it easier for schools to establish and renew vocational programs. I was especially upset with the veto of House Bill 2157 because I was the sponsor of a provision in the measure that created the Commission for Agricultural Education Excellence, a program to improve ag education in our schools. Learn more here. All three bills are expected to be reintroduced in the new 2019-20 legislative session. A new law that requires opioids to be prescribed electronically will bring consistency in the way prescriptions are filled and will also prevent the fraudulent use of prescription pads to fuel the opioid crisis. Act 96 of 2018 will make it more difficult to have fake prescriptions filled, while also making it more convenient for patients who have a legitimate need for the medication. Currently, most all medications are prescribed electronically. Another benefit of e-prescribing is that the tracking of the prescription can go directly to the state’s prescription drug monitoring database to help ensure only those who have a legitimate medical need for these drugs can access them. 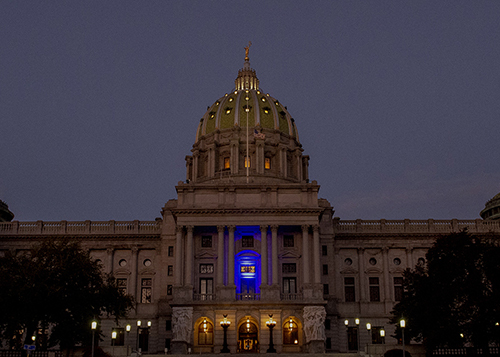 This week, a beacon of blue was the only light shining at the state Capitol as a tribute to the 11 victims of the shooting at Tree of Life Synagogue in Pittsburgh. As a way to help enhance safety within highway construction zones, Act 86 of 2018 will better protect construction workers along roadways. Under the new law, automated speed enforcement cameras will be deployed as part of a five-year pilot program in active work zones along certain federal highways under PennDOT and the Pennsylvania Turnpike Commission’s jurisdiction. Motorists who exceed the speed limit by at least 11 mph when construction workers and these cameras are present will receive a written warning for the first offense, a $75 fine for the second offense and a $150 fine for third and subsequent offenses. Cameras could start appearing as early as the spring 2019 construction season. This legislation was modeled after a similar law in Maryland, which saw a substantial reduction in work zone-related crashes. In 2015, 1,900 crashes were reported within work zones, leading to 23 deaths across Pennsylvania. According to PennDOT, work zone crashes have been increasing at a rate of 5 percent annually since 2012. Daylight saving time will end at 2 a.m. on Sunday, Nov. 4, and you are reminded to turn your clocks back one hour before going to bed on Saturday night. It is also recommended that you check or change the batteries in smoke detectors and carbon monoxide alarms. Smoke detectors and carbon monoxide alarms should be replaced every 10 years, and located near bedrooms and on each level of the residence.